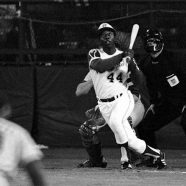 1974 – Baseball player Henry “Hank” Aaron breaks the home run record, hitting his 715th off of Al Downing in the Atlanta Braves victory over the Los Angeles Dodgers iat Atlanta Stadium. While the moment was one of the most momentous in baseball history, it was not an easy path for Aaron. He broke in with the Milwaukee Braves in 1954 and was a very dependable hitter, consistently hitting 40+ home runs per year. He was popular around the league and with fans, but as he approached the record of 714 home runs hit by the great Babe Ruth, things turned ugly. Hate mail came pouring in from from bitter people dismayed that a Black man might threaten the most hallowed record in all of American sports. This hate mail escalated to the point where he began receiving death threats. Every time he walked to the plate, he was on an island of one. The stress and pressure was intense and immense. Aaron would finish his career with 755 home runs and was elected to the Baseball Hall of Fame in 1982.